In this file photo, members of the Metro board of directors take a sneak peek ride from the Culver City to Downtown Santa Monica Stations on the new Expo Line extension on Monday morning, May 9, 2016. The line opened to the public on May 20. The Obama administration has designated portions of South L.A. a promise zone, and the city hopes to use the new status to help residents and businesses take advantage of opportunities created by the Expo and other existing and planned light rail lines in the area. The Obama administration has added nine communities to its effort to ease access to federal aid and cut red tape for areas beset by joblessness, hunger, crime and poor housing. One of the newly selected so-called Promise Zones is South Los Angeles, including portions of Vernon-Central, South Park, Florence, Exposition Park, Vermont Square, Leimert Park and a small portion of Baldwin Hills/Crenshaw. The Promise Zone designation is a cornerstone of President Barack Obama’s anti-poverty and urban development agenda. The designation comes with no guaranteed new federal money but gives communities an advantage in applying for grants, as well as special access to federal employees who act as liaisons and guides through federal bureaucracy. South L.A.’s Promise Zone, dubbed the South Los Angeles Transit Empowerment Zone, or SLATE-Z, is made up of predominantly Latino and African-American neighborhoods. Nearly half of the population are immigrants (42.7 percent), and 46 percent live in poverty, according to a fact sheet from the U.S. Department of Housing and Urban Development. SLATE-Z will focus on helping residents and businesses take advantage of opportunities created by light rail lines. The area is intersected by the Blue and Expo lines, the latter of which was recently extended to Santa Monica. 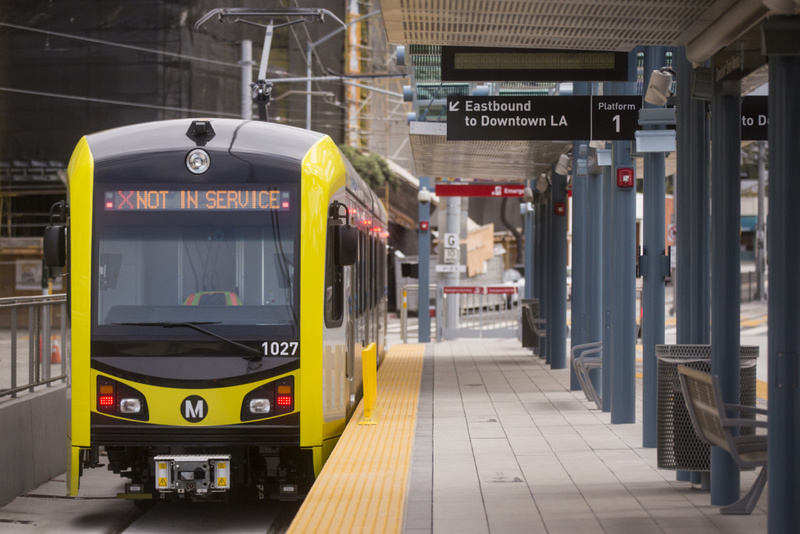 When completed, the Crenshaw line will connect the Expo and Green lines and carry passengers through the area and on to the Los Angeles International Airport. This is the second Promise Zone in the city of Los Angeles. The other has been in place in Central Los Angeles for the past two years. Angelica Solis-Montero, director of community development at the Youth Policy Institute, was involved in both applications. She described SLATE-Z's plan as having a much more narrow focus than the Central L.A. Promise Zone. But focusing on transit-oriented development won't just mean that bus hours will be extended or fares will be reduced. The SLATE-Z vision will move federal dollars towards building affordable housing, community development and job creation around transit hubs. “We have a distinct set of needs. Our economic challenges don’t look like the economic challenges of other cities. It took awhile for the federal government to recognize what economic challenges look like in South Los Angeles. And we achieved that,” McNeill said. The other areas designated Monday include neighborhoods in Nashville, the west side of Atlanta, parts of Evansville, Indiana; San Diego, eastern Puerto Rico and southwest Florida. The Spokane Indian Reservation and communities near Spokane, Washington, and the Turtle Mountain Band of Chippewa Indians and their communities around Rolette County, North Dakota also were selected. The list brings to 22 the number of urban, rural and Indian communities that carry the Promise Zone designation. The designations are awarded in a competition that rewards applicants who’ve crafted a clear and comprehensive plan for addressing the area’s needs, said Cecilia Munoz, director of the White House’s Domestic Policy Council. The place-based approach has a long history of similarly named programs. Each has tried to combat poverty by concentrating federal aid in an area — with mixed results. With bipartisan backing, Clinton administration-era empowerment zones, enterprise communities and community-renewal programs all tried to attract businesses to blighted areas with tax credits, low-interest loans and other advantages. Some of the areas included in the “promise zones” were part of that effort, a fact some point to as a sign of failure. “The next administration may call it something different, but at the end of the day it will be a continuation of the place-based effort because it works,” Vilsack said. It’s too early for definitive data on results. But the administration claims it’s seeing an early impact. It points to a $21 million tax credit secured by the Choctaw Nation zone for construction of a steel manufacturing facility. The Los Angeles zone has won $14.2 million in Education Department grants supporting 17 schools. Sacramento’s Del Paso Heights neighborhood got its first grocery store in 30 years, creating 40 jobs, because the owners wanted to invest in a promise zone, the White House said. The new zones’ goals vary. With a poverty rate of nearly 38 percent, Nashville’s zone, including neighborhoods just south, east and north of the city’s central business district, will aim to improve access to transportation and employment.